Here are some pictures I found from a reconstruction, although the blades are a little crude compared to the original. The site also shows a set of aztec weapons with a macquahuitl and a halberd like spear. They seem to be the last original examples and show really great workmanship. Another, but only slightly larger picture can be found when you search for 'macquahuitl' at google. Sorry for somehow spoiling the link. Thank you very much for these wonderful pictures. I really appreciate it. The best paper on this subject is "The Macuahuitl: an innovative weapon of the late Post-Classic in Mesoamerica," by Marco Antonio Cervera Obregon. 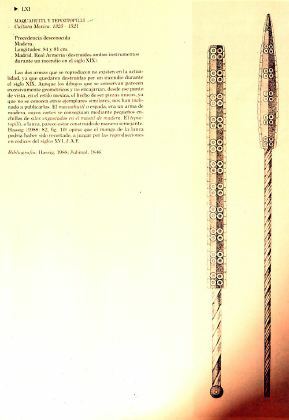 Arms & Armour, Vol 3, No 2 (2006). In this paper the author gives detailed instructions as to how he made his replica and the testing he performed on various targets. He comprehensively debunks the myth that the weapon could sever a horse's head. Where can I buy this article? Thanks a lot for your input. Arms & Armour is the new title of the Royal Armouries journal. He comprehensively debunks the myth that the weapon could sever a horse's head. I'd have to read it, but I'm very dubious. I'll take period accounts over modern tests any day of the week, especially considering that a steel sword could easily behead a horse. You haven't read that period source have you? There is no "eye-witness" account as many people claim. He is repeating nothing but hyperbole told to him by a native who was intimidated by Spanish horses and pretending that he had no need for a steel sword. As I recall the making of ceramic blades is very expensive with kitchen knives running into the $100's. i just think that this would be cost prohibitive. Cool Idea though, maybe you could contact them and ask for broken pieces to use? Pedro de Moron, was a very good horseman, and as he charged with three other horsemen into the ranks of the enemy the Indians seized hold of his lance and he was not able to drag it away, and others gave him cuts with their broadswords, and wounded him badly, and then they slashed at the mare, and cut her head off at the neck so that it hung by the skin, and she fell dead. Y lo pusieron por obra arremetiendo, y echan mano a una muy buena yegua y bien revuelta de juego y de carrera, y el caballero que en ella iba, buen jinete, que se decía Pedro de Marón, y como entró rompiendo con otros tres de a caballo entre los escuadrones de los contrarios, porque así les era mandado, porque se ayudasen unos a otros, échanle mano de la lanza, que no la pudo sacar, y otros le dan de cuchilladas con los montantes, y le hirieron malamente; y entonces dieron una cuchillada a la yegua que le cortaron el pescuezo redondo y colgado del pellejo: y allí quedó muerta. Note that a "montante" is a two-handed sword, so this makes the account even more believable. ah got it. I had a different source. Obregon's experiment seems to suggest that any strike that meets with bone will destroy the edges making it useless afterwards, but the first strike may sometimes cut through bone. He only used a one-handed variant. Not the two-handed type. There is some period documentation supporting this. "... they can split a man in two with a single blow, provided this is the first one, since all further blows are useless, such is the sharpness of this weapon and its fragility." It seems to me that there is a slot around the weapon to hold in the obsidian blades. Is it possible that this would allow damaged sections to be replaced as needed? Indeed, a company named Kyocera has a rather extensive line of excellent ceramic kitchen knives. They are not always that expensive - a paring knife goes for about $35, I think. However, one of their top quality yanagi ba is near $300, if I remember correctly. That's not all that expensive, considering there are some yanagi ba of mirror polished Ao-Ko steel that run for a couple thousand, but that's the way with anything, I suppose - there's always an extreme. I'm not sure this material would really be worthwhile as a substitute, though. While it is more obsidian-like than steel, it's nature is considerably more durable. While it may chip and crack, I doubt there would be the same sort of fracture seen on a relatively thin sheet of obsidian (comparing only to making/using obsidian arrow heads, my only experience with obsidian). I wonder if there is any sort of 'super-glass' that approaches the properties of obsidian more closely? "Hey, Josse! Did you see what that aztec b*stard did to my horse!? nearly took his head right of! D*mn sure hope it recovers, 's a d*mn fine horse..."
Seriously, despite having so sharp weapons, Aztecs, as someone previously said before me, prefered to take prisoners for sacrifices instead of killing them, obviously Floral Wars are not the same that fighting Conquerors, but i guess that they would still try to capture them. Can´t Macahuitl be used as maces after edges were broken? 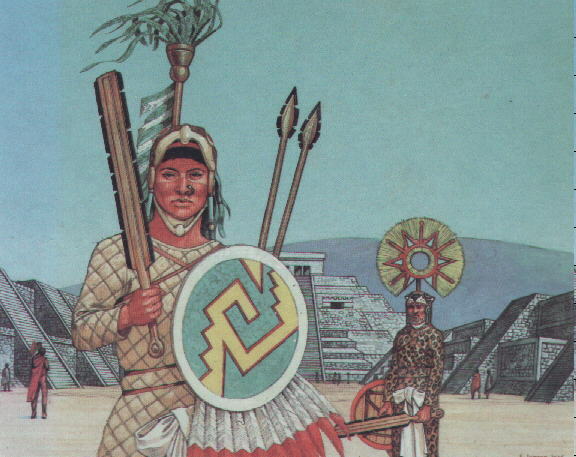 Anyway, does somebody know were can i find Aztec/ Jaguar warrior´s armours? I'm thinking that putting together a Jaguar Knight's kit would have to be pretty much a "Do-it yourself" project, as I don't know of anyone, anywhere making anything even remotely like the proper padded garmets you would need, not to mention the jaguar skin outer layer (which unless you use fake fur, would probably get you in lots of trouble in most countries anyway!). Sorry for reviving this thread, but I felt compelled to step in a squash this myth. If more than one person slashed at the mare, then clearly the horse was not killed with a single stroke. Now unless the Spanish says, the head was cut off with a single stroke then there is no reason to believe that it happened. The English translation paints a picture of several warriors hewing into the animal and its rider, then cutting the head off of the mare, sounds more like butchering the animal than a clean cut.